Book Review – The Wife Between Us by Greer Hendricks & Sarah Pekkanen + a giveaway! YAY!!! I FINALLY got to read this one (and I got it on sale!! I was so thrilled), ’cause I had been stalking it for weeks since its release. A few of my book-buds were raving about it, and well… you know me and psych-thrillers (especially of the downward-spiral stalker kind). LOL! And this had it ALL. In fact, it had me guessing the whole way through, and I couldn’t quite pinpoint who the “villain” really was, in this. 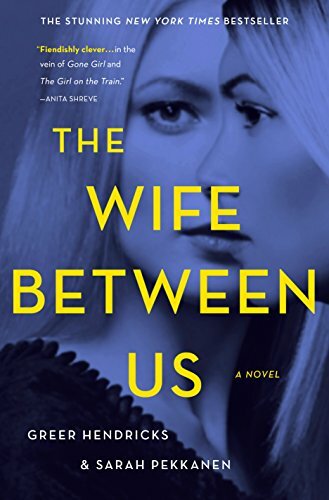 Maryse: I’m reading “The Wife Between Us” and I’m hooked. …I want to devour it. It has me. This is exactly the kind of psych-thriller I love. Will she become a stalker, is she going through a downward spiral, what will she do? Is her ex-husband the bad guy? <— Right now I’m stuck right in the middle in that perception. Clues about her old life with him… as his wife (direct from her own thoughts)… reveal that I’m in for something big. GAH!!! What twist will blindside me?!!! She’s the ex-wife, and her husband is marrying a younger woman, and she has not moved on and wants him back… she seems like she just might be losing it (but bits and pieces of their past life together is being revealed ever so subtly). I LOVE WHEN THAT HAPPENS!!! Maryse: I had an exciting A-HA!!! moment while reading my psych-thriller yesterday (literally, my jaw dropped when it came to me). Suddenly I saw a whole different possible version of the POVs I was reading from… thinking my whole perspective of the women changed. I was excited at the prospects!!! How clever, I thought. And then I was wrong. 😛 Tee hee!! I can’t WAIT to find out what the twist is. I bet it’s even better. I love when that happens! Lisa: The Wife Between Us was good – definitely a twisty turny kind of book. I’ll admit that I almost DNF’d it because I was confused (and you all know how I hate to “work” at my reads), but I am so glad I stuck in there through it all! It comes together beautifully by the end. Can’t wait to see what you guys think when you read it!!! Joy: I saw this in the deals of the day section and lost my mind! It’s been in my wish list forever but I knew it would eventually go on sale! What a wonderful Saturday morning gift! Hilaria: Oh, this is the one I heard so much about! What do they call that? What’s that book term to describe a the main character that is… not unstable. But possibly. Unpredictable. Well, that, yes, but that’s not the term I’m trying to remember. It’s a “book-term”. Unreliable-narrator!!! <— That’s it. And I kept wondering about her… oh how I wondered. 😉 Is she? Is she not? I’ll let you get to know her and conclude for yourself. I LOVE this style!!! Anyway, all that to say, from the eyes of the despondent ex-wife, you find yourself asking… is she just unstable and going through a mental breakdown, or was she wronged? It all comes full circle, revealed in bits and pieces in just the right amounts… in just the perfect timing. The whole journey getting there was unnerving and exciting, and I didn’t know if she was just unhinged, or… well. Anyway. 😉 I loved the entire process, I loved trying to work it all out on my own, and all of my crazy guesses, but in the end end? It surprised me. TWICE! HOW. FREAKING. CLEVER!!!! Vanessa (nicknamed by her husband – er… now ex-husband “Nessie”) is dealing with the aftermath of her divorce. After have lived a life of luxury due to her husband’s wealth (and leaving her teaching job that she loved to focus on having a family), she finds herself… at a crossroads. Her husband has left her for a younger woman, and she’s obsessing about it. Having not fought for her own rights in the divorce, she’s left homeless (now living with her elderly aunt), and was given a tiny lump-sum settlement, and all she has left are the high-end clothes and shoes from her closet. With at least that in hand, she’s back to work, now as a salesperson in a high-end department store, helping the very customers that she used to socialize with. “She turned into a disaster.” Hillary shrugs. It’s as if I’ve slammed into an invisible wall. But accidentally seeing her ex-husband’s new girlfriend in passing, sets her on a tailspin. Even more so, when she realizes they are now engaged and getting married very soon. The roaring in my head suffocates the rest of her words. I nod and back away. Richard is engaged. My husband is actually going to marry her. I make it to a dressing room. I lean against a wall and slide down onto the floor, the carpet burning my thighs as my dress rides up. Then I drop my head into my hands and sob. She becomes obsessed, distraught and sets herself on quite a mission. OH MY. She is oblivious to what I have done to her. She is unaware of the damage I have wrought; the ruin I have set in motion. To this beautiful young woman with the heart-shaped face and lush body—the woman my husband, Richard, left me for—I’m as invisible as the pigeon scavenging on the sidewalk next to me. From past to present, we are presented with an array of personal detail about the heroine herself (from having been raised by a mentally unstable mother, to an event that she’s running from)… you see life through HER eyes. And well… everything, is… questionable. She thinks I’m a victim; just another woman cut down by the approach of middle age. The compassion would be erased from her expression if she knew of my role in our demise. This one will keep you wondering, reevaluating, backtracking, and I have no doubt, gasping in glee when it all comes together. Especially the day after you’ve finished, had some time to refresh, and suddenly it becomes even clearer, in retrospect. Ahhhhhhhhh WOWOW!!! The only part I could have done without was the epilogue. Strange, right? Those usually bring us an immense amount of relief. This one brings us an added touch of whaaaaaaaa?, and, although it doesn’t take away from the story, to me, was over-the-top considering the realistic aspect of this story as a whole, and unnecessary. No. It doesn’t leave us un a cliffhanger, but the main story as a whole was perfect for this genre, so that epilogue was one twist too many. And I DO love my twists. I sat there… tapping my scrunched up lips, thinking… really? REAAAALLLY? But you know what? I’m going with it. 😉 LOL!! Why not? READY FOR THE GIVEAWAY? St. Martin’s Press is partnering with me for a giveaway!!! I am assuming the publisher heard I was reading this (or maybe this was just BLIND LUCK), but they reached out to me and offered a book for one of our lucky commenters here!! St. Martin’s Press is partnering with me for a giveaway!!! Winner receives a copy of The Wife Between Us and a Lo & Sons weekender bag. How to enter to win? Just leave a comment below (or better yet, let me know what book you read that had the biggest jaw-dropping reveal or twist that you didn’t see coming – romance, thriller, any genre!!!) and by Tuesday night (Tuesday June 12th 2018, 10pm EST), I will randomly choose a winner. Winner will be contacted by email, and must reply within 48 hrs with their mailing address so St. Martin’s Press can send you your prize. :D!!! Oooh! What an awesome giveaway! I would love the opportunity to win this one as this book sounds right up my alley. Thank you to St. Martin’s Press for the prizes and thank you, as always, Maryse, for running the best blog on the planet. The best twist in a book that I have ever read… to this day, remains the twist in Jezebel… you know the one… I still remember the night it brought me here cursing at 2 am… haha! Again, thank you for the opportunity! And good luck to all! The twist I had to wrap my head around was Opaque Mirrors. Yikes. This book wad fantastic! Not what I was expected at all. Ok, I was racking my brain trying to think of the biggest jaw dropping moment in any of the thrillers I’ve read and then I remembered my biggest shock of all… when I first started getting back into reading, honestly I think this was like the 4th book I’d read, and I was so into it and then BAM!! Jaw dropped, lost my breath, continually flipped back and forth saying ‘Omg! No way, is this a joke? !’ And proceeded with my first and maybe only “ugly cry”. Lol And that was Taking Chances by Molly McAdams. I love twisty books!! The one that always comes to mind 1st is Black Lies by Alessandra Torre. I love going back and rereading to see the clues again after knowing the outcome. Neighbor bought hardcover. She likes to read end of book early. Lol. Well she got lost and didn’t undestand at all. So warning. Read every word, no skimming, no nozing and no reading ahead. This book has so many “hints” that it is easy to miss what and who is doing what. Well I passed to another neighbor, then to DIL and she passed to neighbor. We rarely pass a book this much. Another book that had me really guessing was Tight by Alessandra Torre. I would have to say Carnage gave me a WHAT moment and has stuck with me for years. I’ve been scoping out The Wife Between Us it sounds very intriguing and I’m always looking for a book that has my jaw dropping. Thank you for the chance!! I’m going to say The Masons list by SD Hendrickson or Taking Chances by Molly McAdams. Oh how I love your giveaways!! One of the best plot twists for me was Gone Girl. Thanks Maryse! This sounds like a great book. Thank you for a chance to win it. I will have to go with Connected by Kim Karr as a plot twist I didn’t see coming. I’ve been waiting to read this one! Mine is The Nightingale by Kristin Hannah. I couldn’t put the book down and was teary-eyed in the end. Just finished, “If You Say So” by A.R. Myles yesterday & I did not see that end coming. I loved the authors words after the book ended. The Wife Between Us is on my list! Oh gosh! I would have to say Black Lies by Alessandra Torre is definitely one that had me stumped until the end!! The Ghostwriter by her was so good, as well!! Rainfall by Melissa Delport, ooooh when everything started falling into place! As always, great review! I’ve been wondering about this book! The Headmaster by Tiffany Reisz was a complete shock to me. Thanks for the chance! The Idea of you ! I wanted them together !!!!!!!!!! Glad you loved it Maryse! Great review! I missed the sale and I refuse to pay 13.99 for a kindle book by an author I have never read. I remember it going on sale so my fault. Maybe it will go on sale again. Sounds like a good book. This sounds awesome, can’t wait to read it!! I think this is going to be bumped up on my TBR list lol. Great review! Hmm I can’t remember the last book I read that had a really shocking twist. Maybe Rainfall by Melissa Delport or Unravel by Calia Read. OMG!! The book that had the biggest twist was Sometimes I Lie by Alice Feeney. It was REALLY good! You should definitely read it!! I even had to stop, read some to my daughter (who knew nothing about the book), and reread the paragraph again. If you read it I would love to see you review. This book sounds intriguing. I would love to win it. I have to with a classic and say Murder on the Orient Express was one I did’t see coming. I would love to win this book. Thank you for the opportunity. You have been my go to book blog for years. The book twist that sticks out in my mind would be Jezebel. I definitely didn’t see that one coming. This sounds so good! The book twist for me was for sure Jezebel!! And I can usually see a twist coming – – didn’t see that one! Thank you for this chance! One book that comes to mind for me was “A Good Girl,” by Mary Kubica. I love your blog, you are my go to for book recommendations and the witty commentary that you post from your readers in a book review. So, I wanted to comment on a book that I just read over the weekend, “Dangerous Girls.” Yes, this book is older but I read your review, one-clicked it and literally read the book in one sitting. I was completely blown away by the ending, the book really messed with me in a way that I can’t describe. The entire book had me trying to guess the ending and then at the end, with the final twist, I was completely stunned. I think the best book for what I didn’t see coming was Taking Chances by Molly McAdams. I had no idea that she could do that to her characters, I think it devastated me more than the author. It was a really great book and I remember it 6 years later. fingers crossed I am the lucky winner! I have not read a good plot twist lately. I love a book that has that Twist you never expect – The Cleaner by Kiersten Modglin is the last one that did it to me. Sounds right up my alley and I am looking for my next good read! Thanks! Thanks for the chance! This looks like a good book!! Putting it on the “To Read List”. I really want to read this one!! Thanks for he giveaway! Amazing giveaway, thanks for the chance. I am mostly an ebook person but when I get a paperback I cherish it. One of my favorite books wasnt so much a jaw dropper but I wanted the ending to change up until the last words, make it a dream sequence or have a change of heart was ….Me before you by Jojo Moyes it just gutted me. A book that stayed with me to this day. Sounds like a great book!! Moonshot by Alessandra Torre had a great plot twist. I would love to win this book. Gone Girl had pretty good twist. I’ve heard so many good things about this book, I wish I had grabbed it when it was on sale! Would love to win a copy!! No big twist in anything I read recently. Black Lies was a big jaw dropper for me! Crazy!!! I can’t wait to read this story!